What is a Memory Box? It is a shadow box in which you place special mementos which honor the memory of your loved one. A Memory Box may help to integrate the memory of your loved one into your life. This is an activity that you could recreate with family and friends anytime (Download the instructions). What kind of box do I need to get? The boxes we use are called “shadow boxes” and they come in a variety of sizes. We have used 8″x 10″ boxes that are 2″ deep. There are two types of boxes that we have used. One is found in the frame section at craft stores and has finished stained wood. The interior surface allows you to adhere items with Velcro. This gives you the ability to add some dimension by mounting items into your box or mounting heavier things by using Velcro dots or strips. Another type of box available is an unfinished shadow box which can be found in the wood section of a craft store. These also come in different sizes, and often have a hinged front that opens for easy access to the inside. The front has a 1″ flat frame which provides a good place for adding words or quotes, and the inside of the box can be lined with decorative paper, fabric or whatever you might like. You can also paint or stain the box. Both of these boxes can either hang on the wall or sit on top of a table. Where do I get my materials? Most any craft store. Below, under the “Resources” section we have provided links to some of the online craft suppliers. Quotes – Transparent velum often available in books or sheets. First give yourself sometime to sit and reflect on what you may want to place in this Memory Box. The realization that there is no way this little box could even begin to hold the endless memories you wish to hold close will be very powerful. Take the time to write down what you would want to put in this box if it had unlimited space. Reflect on memories surrounding those items, and allow yourself to be held by these memories. You may decide to put these reflections in a special notebook to be kept with your Memory Box. Then decide which of these items you want to place in this box. Decide if you would like to invite either a family member or friend to join with you in doing a Memory Box. Just remember, it is very important for you to do your own box, that contains your own special memories. After you have done your own a group could do a box together. Spread out all the items that you selected and begin placing them in the box. If this feels too overwhelming, ask a friend to help you think about what to place where in your box. Be gentle with yourself, and honor the powerful emotions this touches. What kind of things can I put in my box? 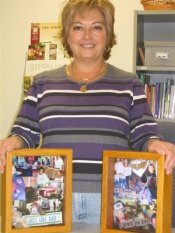 Debbie Hutt, Director of Donor Family Services, demonstrates how to create a Memory Box in the video below.